Cut 1 border as normal, once cut move the die down and adhere with removable tape so the die doesn’t slip. Then put the die back through the grand calibur as normal. 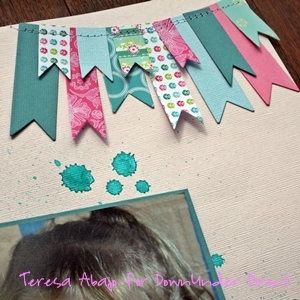 You can also use the edgeabilities to make fun funky patterns on your cardstock or patterned paper. 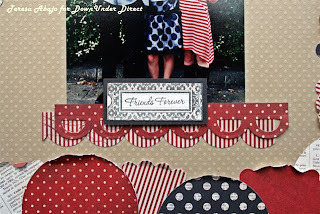 Boys are always hard to scrapbook, here the Grand Scalloped Circles have been used to add a background element. 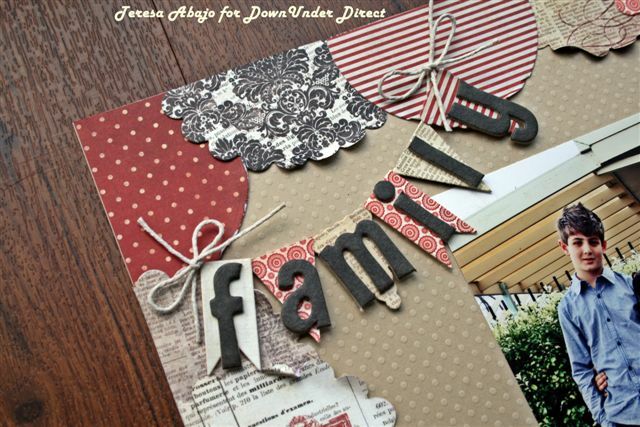 Die sets like the Nested Pennants, have small pieces that are great used in repetition. Today we have a lovely butterfly mobile created by Teresa. "This was a fantastic project to keep my girls busy on the school holidays. 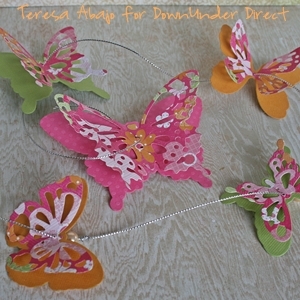 It’s a simple matter of die cutting the butterfly shapes, and threading them onto some cord. I added a bead under each butterfly to weigh it down a little. 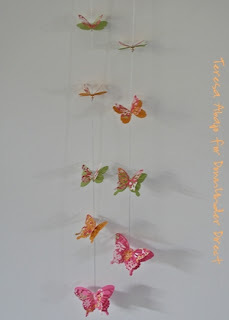 I can imagine a few more of these hanging from the curtain rods in their bedroom windows, fluttering in the summer breeze." 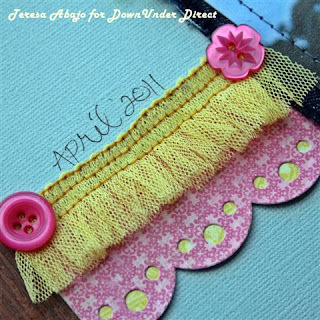 Today's project is a pretty card using papers from the Bazzill paper pack Divinly Sweet. Today we have a simple masculine card to share with you. Today I have one of my double layouts to share. I've kept this one pretty simple with the minimal use of embellishments. Valentine's Day is a couple of weeks away, but I thought I would share this love inspired card here today. 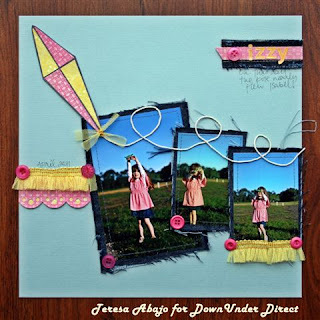 Today we have a super cute summer layout to share with you. "The banners were made with the small dies from the pennants sets. I only attached them at the top, leaving the ends to be gently bent up for extra dimension." 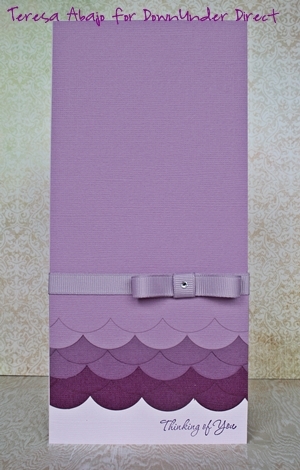 Today we have a monochromatic card in lovely warm shades of purple. 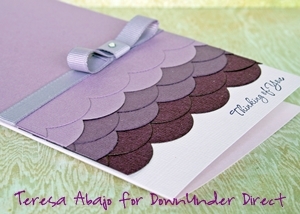 Teresa has used a very very light shade of purple for the base card – not white as it would have been too stark. Well the summer holidays are coming to an end. It's back to school Monday for most kids here in Australia, so today we have a double page layout to share with you. Today we have a pretty card from Sue. "This card uses 4 of the Iron work Motifs folded in four to form a lacey rosette." Today's layout is from Teresa. 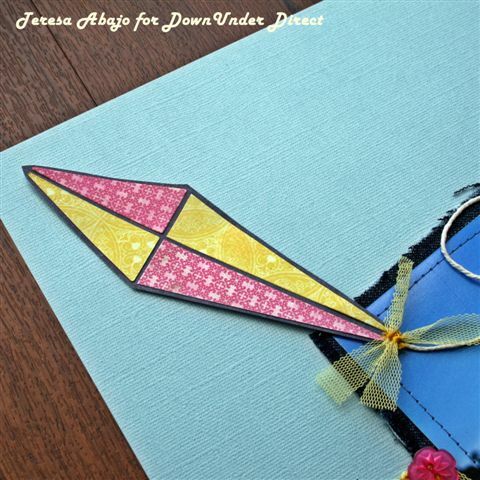 "The kite Isabel was flying this day didn't appear in any of the photos, so I made one using some of the dies in the Nested Pennants set. She is wearing a denim skirt in the photos, so I machine stitched the photos to some denim fabric and frayed the edges for some extra interest. The loose threads add movement and even look a little wind-swept." Welcome to our first tutorial for 2012. This week we have a lovely idea to give the leaves on your page or card an extra little sparkle. Cut several leaves from the Foliage collection. Spritz the leaves with a green Glimmer mist, any brand will do. Score lines with a paper piercer, on each leaf make them look like the veins you would normally see on a leaf. This is better if it is done on a mouse pad. I take a cheap mouse pad and cut it into 4 pieces so they are easier to transport and use. Use a dark green water soluble pen to mark in the scored lines. A Tombow pen or equivalent is good to use, but it must we water soluble. Take an Aqua Brush and wash over the pen lines, you notice that the glimmer mist and pen blends together, but that a darker line remains in the score line, resembling the veins of a leaf. Repeat these steps for all leaves and use them as you would normally. Today we have a fun layout created by Sheree. Today we have another card made using the JustRite set Spread Your Wings. 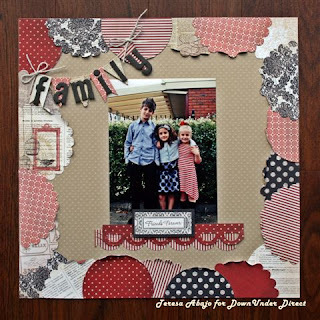 Today we have another lovely layout to share with you. Today's project is a quick and easy card. Welcome back. I hope that everyone had a lovely Christmas New Year break. The design team are now back and ready to inspire with lots of wonderful projects. This month we have a mixture of projects including some with a Valentine's love theme. 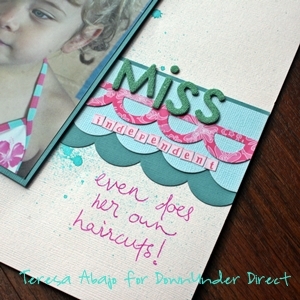 "With the clever use of a Mini Mister you can dampen Bazzill card stock so that it will go around corners and circles. Just carefully use your fingers to shape the card and then heat set, then a rapid setting glue to adhere down."